Japan should serve as a lesson to central planners around the world. Japan’s stock market/ real estate bubble burst in the early ‘90s. Since that time Japan has launched NINE QE efforts equal to roughly 25% of its GDP. And GDP growth has worsened despite these efforts from 2% to 1%. Ditto for employment. Japan elected a new Prime Minister Shinzo Abe in September 2012. Since that time, his primary belief has been that Japan hasn’t engaged in enough stimulus. He threatened the Bank of Japan to get working… and it did, announcing a $1.4 trillion stimulus last month. 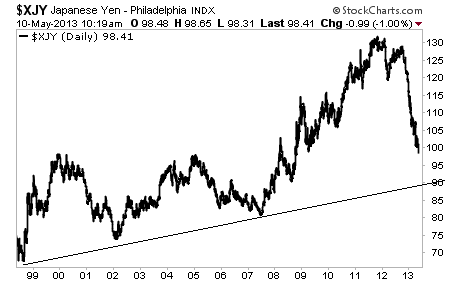 Since that time, the Yen has positively imploded. It broke below 100 yesterday for the first time in years. It’s now fast approaching the long-term trend line. When we take this out, it’s GAME OVER for the great monetary experiment of Japan. Japan has a Debt to GDP of over 200%. Japan’s demographics are terrible (the country sells more adult diapers than child diapers). Its economy has been imploding for 20 years, and now its truly epic bond bubble is on the verge of collapse as well. If you thought Greece was bad for the financial system, wait until you see what Japan will do to it. I’ve been warning subscribers of my Private Wealth Advisory that we were heading for a dark period in the markets. I’ve outlined precisely how this will play out as well as which investments will profit from another bout of Deflation. As I write this, all of them are SOARING. Are you ready for another Collapse in the markets? Could your portfolio stomach another Crash? If not, take out a trial subscription to Private Wealth Advisory and start protecting your hard earned wealth today!